Famous Quote: Foolish little brother, if you wish to kill me, hate me, detest me, and survive in an unsightly way. Run, run and cling to life. Background Itachi Uchiha is a missing-nin from Konohagakure, and a prominent member of Akatsuki, partnered with Kisame Hoshigaki. He is Sasuke Uchiha's older brother. Itachi is relatively popular among many fans of Naruto, often having ranked in the top ten in Shonen Jump magazine's popularity polls since his introduction. He was first ranked in the third character popularity poll ranked in 11th place. He was ranked 9th place during the fourth popularity poll, and 6th place in the fifth popularity poll. During the sixth popularity poll, he again was ranked in 11th place. In the last poll, he was ranked in 5th place. Itachi was born into the Uchiha clan and was praised by all as the best of his generation - a genius above all others. Even by the standards of the battle-adept Uchiha clan, Itachi's prowess far outshined all others. However, not even his family, friends, or teachers could understand him. When he was only 4, Itachi had already witnessed countless lives lost due to the Third Great Shinobi World War, which emotionally traumatized him and turned him into a pacifist. At age 7, he graduated from the Ninja Academy at the top of his class after only one year, mastered the Sharingan at age 8, passed the Chunin Exams at age 10, and became ANBU Captain at age 13. According to Madara Uchiha, Itachi also had a lover, whom he killed during the Uchiha clan massacre. He was praised highly by his father, who saw the family's future in Itachi, hence neglecting his other son - Itachi's younger brother, Sasuke. However, during this time Itachi showed great affection towards his little brother, Sasuke, and even encouraged his father to come to the Academy when Sasuke was enrolled, something their dad had otherwise forgotten, by saying that he would not go to an important mission, that would establish Itachi a place in the ANBU ranks, otherwise. When the Uchiha began planning to overthrow Konoha, Itachi, as an ANBU, was tasked with spying on the village. Knowing that a coup d'etat would only lead to another Ninja War, Itachi chose to spy on the Uchiha instead, passing on information to the Third Hokage and the other Konoha elders. After this he began to act strangely, not attending the clan meetings, speaking out against the clan, and becoming the prime suspect for the murder of his best friend, Shisui Uchiha. The clan lost hope in Itachi, and his father began shifting his focus to Sasuke instead. Meanwhile, the Third's attempts to negotiate a bloodless end to hostilities between the two parties were proving ineffective, so, against the Third's wishes, Danzo and the Konoha Council ordered Itachi to wipe out the Uchiha. Before the fateful night arrived, Itachi discovered the existence of Madara Uchiha, who was attempting to rekindle the flames of war in Konoha. In return for not attacking Konoha, Itachi offered to help Madara claim vengeance against the Uchiha for turning their backs on him decades earlier. Madara agreed. Itachi slaughtered his entire clan overnight, sparing only Sasuke. Sasuke's life was worth more than the village to Itachi, and he could not follow through with the orders to kill him as well. Instead, he made himself out as a villain, who had killed their innocent family only to test his abilities. By doing so, he wanted Sasuke to take vengeance on him and become a hero to Konoha, thus redeeming the Uchiha name. He tortured Sasuke with his Mangekyo Sharingan, and encouraged him to become strong enough to kill him and avenge their family. Hoping that his beloved little brother would someday be powerful enough to kill him, Itachi left the village as a traitor. Knowing that Konoha would still want to eliminate Sasuke, Itachi pleaded with the Third Hokage to keep Sasuke safe. He also threatened Danzo to not harm Sasuke or risk him revealing everything he knew about Konoha's secrets to enemy countries. Sasuke's safety was therefore secured, and Itachi returned to his original plan of becoming infamous for his slaughter of the Uchiha. Itachi joined Akatsuki in order to keep an eye on the organization, along with Madara Uchiha, in case either ever acted against Konoha, all the while planning for his death at Sasuke's hands. While a member of Akatsuki, Itachi was approached by Orochimaru, who tried to steal his body to gain the Sharingan. Itachi trapped him in a genjutsu and severed his left hand as punishment, forcing Orochimaru to flee the organization. Sometime after joining Akatsuki, Itachi later helped recruit Deidara, Orochimaru's replacement, by beating him in battle, after which Deidara swore vengeance again. Personality Ever since his first appearance, Itachi had always been mysterious, and had acted as though he was hiding his true self. While flashbacks to his past showed that he was a compassionate brother and person, his later acts and claims made it seem that this was mostly just an act. But, surprisingly, he genuinely was the compassionate brother he had once claimed to be, although he hid this from the rest of the Akatsuki to protect Sasuke. As a member of Akatsuki, he possessed incredible self-control of his emotions. He constantly displayed an emotionless personality. He only showed surprise when opponents proved more powerful or skilled than he had expected, and even then he didn't lose his composure. He did not possess any arrogance, and fully justified any statements he made about his power, even complimenting his opponents at times on their abilities. In addition to being an extremely powerful ninja, Itachi had equally impressive intelligence, and was shown to be very wise. He was exceedingly sharp and observant to any situation at hand, as he was rarely surprised or caught off guard. He also displayed great intuition, as he was almost never deceived and even then almost instantly realized the truth. Despite his status as a wanted criminal, and having murdered a significant portion of his family, Itachi took no enjoyment in violence or combat, instead preferring to avoid battle or, if this was not possible, end it as quickly as he could. Itachi's only initial interest was in Akatsuki's goals, and his only loyalties appeared to be to the organization and its members, seeming to put the organization's success and secrecy before everything else.As such, Itachi got along with his partner, Kisame, much better than most other Akatsuki members did with their own partners. Kisame appeared to have a deep loyalty to Itachi, immediately doing as he instructed and constantly looking out for his well-being. Itachi treated all of his fellow Akatsuki members to this same, more respectful personality, although his courtesy was rarely returned by the other members. However, when he was in a genjutsu duel during his fight with Sasuke, he cruelly claimed he had only let Sasuke live so that he could take Sasuke's eyes and obtain his own Eternal Mangekyo Sharingan, after which he then claimed the Uchiha clan had been nothing but tainted and evil, since many members would kill their friends to gain the Mangekyo Sharingan, and would take another Uchiha's eyes to make its power permanent. Once the genjutsu was released, he called it his true self, implying his calm, emotionless personality was also a facade. This persona was later revealed to be only an act to ensure that he would die by Sasuke's hands, his love for his younger brother being the fundamental aspect of his personality. Despite his status as an infamous shinobi, his appearance was not the most intimidating, apart from the intensity of his eyes. While living in Konoha, he would regularly have a gentle and caring look in his eyes, especially directed towards his younger brother. After joining Akatsuki, he would regularly have a stern look to them. He was a fairly tall shinobi, whose basic appearance was very much like the rest of his clan. He, like all members of his clan, possessed dark grey eyes, and also had black hair that hung near his cheeks to frame his face. He also had the addition of a long ponytail in the back of his hair (which he obscured with his Akatsuki cloak after joining the organization). Being brothers, Itachi and Sasuke had a similar appearance, but with subtle differences. 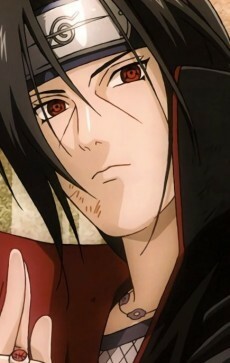 Itachi's hair color appeared slightly duller and with a softer flow to it, without the spiky style at the back. His skin was also slightly darker. Itachi's most distinguishing characteristics were the long pronounced creases under his eyes. When he lived in Konoha, his casual clothes would consist of a black shirt with a large Uchiha clan symbol on the back of it, and black pants with a weapons pouch strapped to them. When on duty, he would wear the traditional ANBU uniform, although he was never shown wearing a mask. As a member of Akatsuki, he wore the traditional Akatsuki cloak, and usually kept the center of it buttoned down. After his cloak was incinerated by Sasuke's Kirin during their fight in Part II, it was revealed that he still wore his casual clothes underneath it. Like almost all members of Akatsuki, he wore the headband of his home village, Konoha, with a line gouged through it, to symbolize his broken ties with the village (although, secretly, he was actually still loyal to his village). Abilities Since a young age, Itachi's intellect and talent showed their brilliance in everything he did, as even his teachers said his progress hardly required any help. In the few battles he had been seen in since the start of the series, Itachi was shown to be an incredibly powerful ninja, and easily one of the strongest in the Naruto series, as demonstrated by his ability to easily defeat Deidara, Sasuke, Kakashi Hatake, Kurenai Yuhi and Orochimaru (twice), who themselves are considered amongst the strongest ninjas in Naruto. Being a pacifist, Itachi did not actively take part in battle, typically only acting in self-defense. Sharingan Being of the Uchiha Clan, and as noted by Kakashi, Itachi was a true successor of the Sharingan Eye. From a stationary position, he would study an opponent's movements with his Sharingan and respond accordingly, often with a genjutsu. He could cast a genjutsu by merely pointing at or looking at someone, and could similarly turn an opponent's genjutsu against them with Demonic Illusion: Mirror Heaven and Earth Change. Itachi had trained so much with his eyes that he had reached the stage where he could have his Sharingan activated the entire time, with minimal drain on his chakra levels. Mangekyo Sharingan Itachi possessed the Mangekyo Sharingan, which increased his already great power, and enabled him to use his most powerful techniques. With his left eye, he could use Tsukuyomi, a genjutsu that traps an opponent's mind in an illusionary world, torturing them for what seems like days in a matter of seconds.With his right eye he could use Amaterasu, a ninjutsu which allowed him to create a black flame that he could direct by moving his eye to burn through seemingly anything in its path, including fire itself. His final technique was Susanoo, a technique that manifested itself as a spectral being, labelled as the "Raging God of Battle" in the databook. It wielded the Totsuka Sword, an ethereal sword with the ability to seal anything it pierces into the gourd that serves as its hilt, and Yata's Mirror, a shield that can reflect any attack. Zetsu, a fellow Akatsuki member, stated that Itachi's mastery of the Sharingan, combined with the legendary weapons of Susanoo, made him invincible. Despite his mastery of the Mangekyo Sharingan, Itachi suffered greatly from its side effects. His eyesight would worsen after every activation of the Mangekyo Sharingan, and he would eventually go blind from its power, with his Sharingan forever sealed away. Itachi was so close to blindness that, by the time he activated Susanoo in his final fight, both Sharingan eyes had become almost blind, and had turned white. However, he was still able to perform his own Fūinjutsu in his last moments.